We know the final score of last night’s Game Three of the World Series: Cardinals 5, Red Sox 4. And, by now, we do believe what we just saw in the bottom of the ninth — we’ve all watched replay after replay after replay. We as Cardinals fans are thrilled. Baseball fans who understand the rules — and appreciate the umpires not only making correct calls but also having a press conference with Joe Torre after the game to further explain, by reading the rule book, how the correct call was in fact made — are pleased with the outcome, even if the ending was something none of us have ever seen in a World Series game. Everyone else? Not happy, to put it mildly. Red Sox fans (and players) in particular. Plus those furious it’s the Cardinals benefiting from this call — Cubs fans, Reds fans, Pirates fans, probably Dodgers fans. Especially Braves fans, remembering last year’s wild card game and the infield fly call. 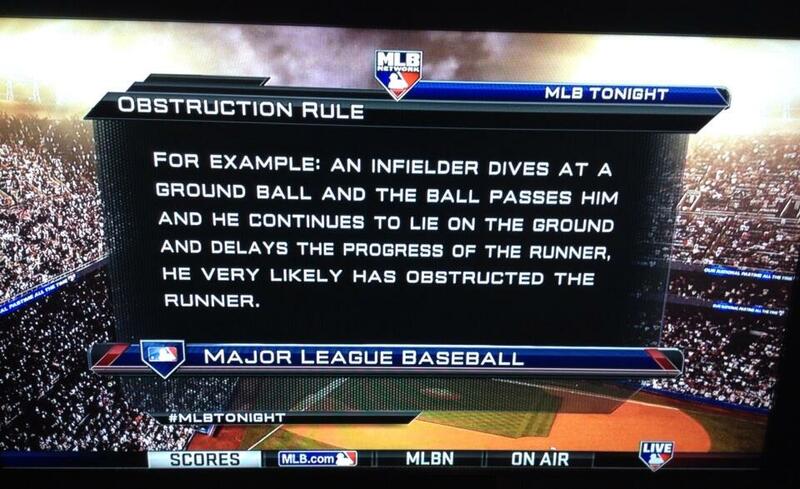 How about the rest of the game, though, before Jon Jay stepped up to bat in the bottom of the ninth? Now this would have been an awful game to lose. It started out fine, with Joe Kelly throwing only 11 pitches ranging from 95 to 98 mph to retire the first three Red Sox in the top of the first and Matt Carpenter leading off the bottom of the inning with a single to right. Then it got weird: Carlos Beltran — you know, October superstar, all-time leader for postseason slugging percentage — hit a sacrifice bunt, on a 3-1 count. But that did allow Matty Carp to score when Matt Holliday singled. And Holliday scored after a Matt Adams single moved him up to second and Yadi singled to left. First inning, two runs? Good deal. Bottom of the fourth, bases loaded, no one out. Pete Kozma called out on strikes. Joe Kelly popped it up to second (infield fly!) Matt Carpenter popped it out to short. No runs. After the Red Sox scored one in the top of the fifth and tied it in the top of the sixth, the Cards took the lead in the bottom of the seventh — Holliday continued his World Series heroics and doubled to drive in Carpenter, who’d singled, and Beltran, who’d been hit by a pitch. Holliday was at second with no outs, so the perfect chance to add on. Except Matt A struck out. Yadi struck out. And, after a walk to David Freese, Jon Jay flied out to center. The top of the eighth showed us that, oh yeah, Carlos Martinez and Trevor Rosenthal are still kids and are not always automatic. Martinez left with the bases loaded — though the runner at first, David Ortiz, was put there intentionally. Rosenthal came in for a five-out save … that was quickly blown. Tie game again. Bottom of the eighth: notable for Kolten Wong singling in his first World Series at-bat, then stealing second shortly thereafter. Excellent job, kid! Top of the ninth, Rosenthal retires all three Sox he faces. Bottom of the ninth, Matt A struck out and Yadi singled. Allen Craig pinch-hit for Rosenthal as all Cardinals fans were hoping for a Kirk Gibson-esque moment 25 years later. Instead we got a double to the left field corner with Yadi stopping at third. We know what happened from there. More importantly for us as Cardinals fans, Allen Craig’s foot seems to be OK.
And the Cardinals now have a 2-1 World Series lead. The bottom line is the bottom line — the rest will be debated (and debated and debated and debated) for a while now. My only question to all the Sox fans and players protesting so vehemently: what would you think of the call had the teams been reversed? Game Four is tonight, starting at 7:15 p.m. Central Time, with Clay Buchholz and Lance Lynn starting. Christine Coleman is the lead writer for Aaron Miles’ Fastball. Follow her on Twitter, @CColeman802, or email aaronmilesfastball@gmail.com. Also follow @AMilesFastball for the latest updates. This entry was posted in 2013 Season and tagged Allen Craig, Boston Red Sox, Carlos Beltran, Carlos Martinez, Joe Kelly, Jon Jay, Matt Holliday, Obstruction, Postseason 2013, St. Louis Cardinals, Trevor Rosenthal, Umpires, World Series, Yadier Molina by Christine Coleman. Bookmark the permalink. You just called out people whose blind venomous hatred of all things Cardinals would throw out the rule book, just because of their emotional reaction to the object of their hatred getting a win in Game 3. You reminded me of perhaps my most favorite quote in all of literature, from the play A Man of All Seasons. Its protagonist is Thomas More, who stood up to Henry VIII when the King rejected the Catholic Church’s refusal for divorce. It’s a courtroom scene. William Roper: Yes, I’d cut down every law in England to do that! Sir Thomas More: Oh? And when the last law was down, and the Devil turned ’round on you, where would you hide, Roper, the laws all being flat? This country is planted thick with laws, from coast to coast, Man’s laws, not God’s! And if you cut them down, and you’re just the man to do it, do you really think you could stand upright in the winds that would blow then? Yes, I’d give the Devil benefit of law, for my own safety’s sake! People whose blind, emotional hatred of the Cardinals would cut a great road through the rules of the game just so the object of their hatred would lose, completely ignorant to the possibility that someday should the situation be reversed, the lack of enforcement of baseball’s rules could unfairly benefit the Cardinals at the expense of their team. This also reminds me of politics, where there always are people whose knee-jerk emotions drive stupid lawmaking. These would be people who think a new law would reverse a bad thing in life, or “make sure this never happens again.” Fortunately, I’m not hearing from anyone except Cardinals Haters that the obstruction rule should be changed. Baseball doesn’t put “intent” in the obstruction rule, which is fortunate, because umpires aren’t mind readers, and unlike football or basketball, baseball doesn’t change its rules out of an emotional reaction to a very rare event.